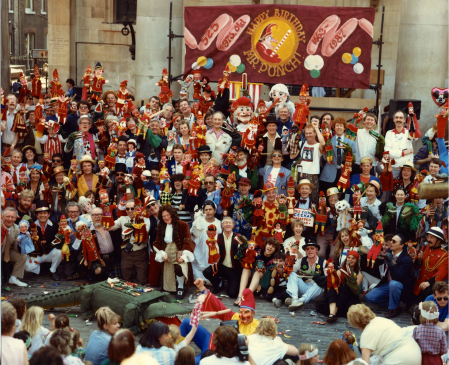 The 325th Anniversary of Punch & Judy in Covent Garden, London in May 1987. Here are a compilation of Puppetry Interviews and a few reports from a collection I have archived over many decades. From the time I got my first cassette tape recorder in the 1970's, I began collecting interviews and sound clips from puppetry events around the globe. During my six years of study at the Institute International de la Marionnette in Charleville, France, I always recorded my lectures from 1981 to 1987. These will be added below as the archive grows. BTW You can watch the video from the Punch & Judy celebrations in 1987 here! The following lectures and discussions were recorded at Suspense Festival 2015, London. They are important documentation of the events held in the puppetry for development category of this year's festival. I trust you find them both stimulating and enjoyable. To view the video content, click here! The following eight audio archives are from a collection of puppetry interviews made at the UNIMA World Puppetry Congress in Dresden, East Germany in 1984 by Gary Friedman, who introduces the interviews in the first of the audio recordings below.